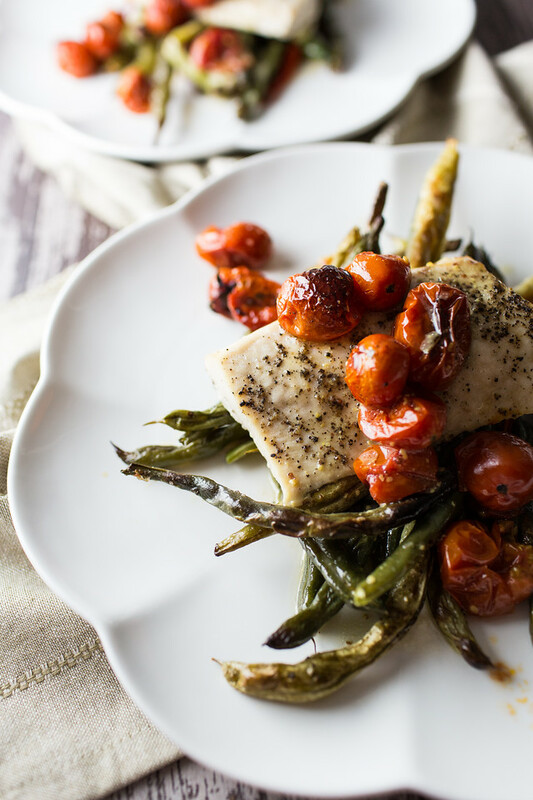 Click here to pin this Roasted Mahi Mahi with Green Beans and Cherry Tomatoes now! 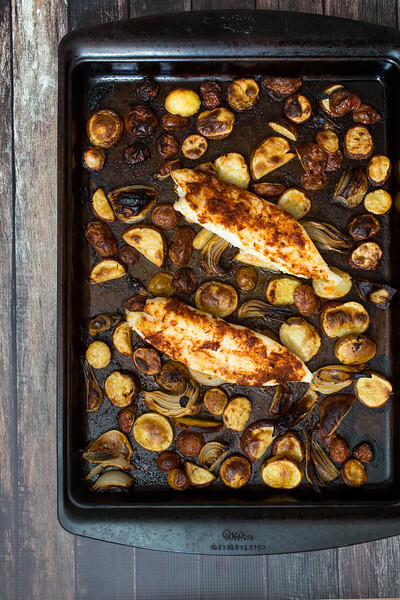 Healthy sheet pan suppers have become my favorite thing to cook. They are so easy to prepare and so easy to modify. All you need to do is check on the individual roasting times for your vegetables and your protein. Then you simply start with the longest roasting item and then add each additional food, so that they all finish at the same time. Once you have everything roasted, you can serve it as is or you can make a quick vinaigrette like I did for this recipe. It adds a little freshness at the end and brightens the flavors. This recipe came about one evening, when I had no idea what to make for dinner. I looked in my fridge and choose the green beans simply because they were taking up the most room in the fridge. There were some cherry tomatoes on the counter. All I needed was a protein, a quick glance in the freezer turned up some mahi mahi. Figuring the easiest thing to do would be to roast it all, I was off and running. The thing that really finishes this though is that at the end when serving it, I topped it with a simple lemon mustard vinaigrette. It pulled everything together. This was so good and so easy. Note that I used two baking sheets for this. I wanted to be able to spread out the green beans and the tomatoes so that they roasted and didn’t steam. Crowding the baking sheet will cause food to steam, you need to allow air to circulate around the food so it can brown. 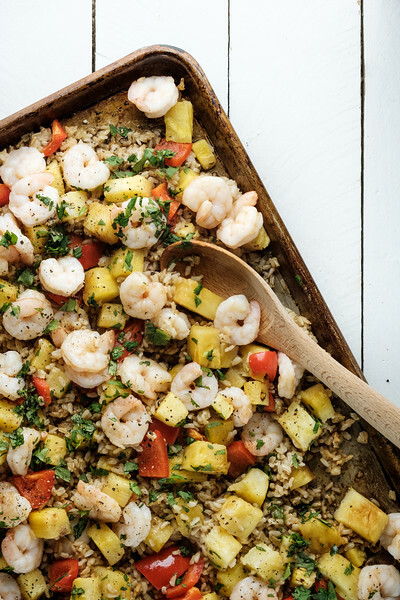 Just look at how gorgeous this Sheet Pan Shrimp with Pineapple is! Harissa adds spice and heat to this Harissa Tilapia with New Potatoes. 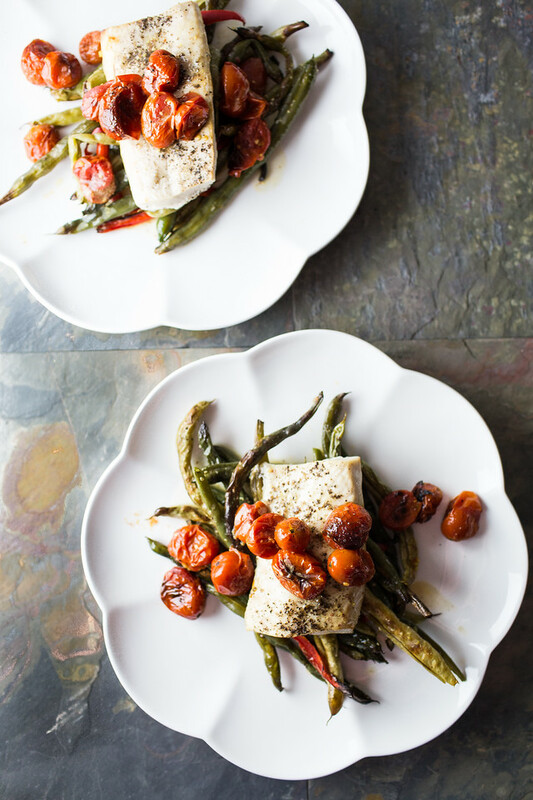 This Roasted Mahi Mahi with Green Beans and Cherry Tomatoes is an easy sheet pan dinner that you'll make over and over again! Place mahi mahi on half baking sheet and drizzle with olive oil and salt and pepper. Place green beans and red chile pepper on a baking sheet and toss with a little olive oil and salt and pepper. Spread out in a layer, leaving room for cherry tomatoes. Place cherry tomatoes on end of baking sheet, drizzle with olive oil and salt and pepper. Place in oven and roast for 10 minutes. Place mahi mahi in oven. Continue to roast green beans and tomatoes and mahi mahi for 10 more minutes. Meanwhile place 1 tablespoon of olive oil, the lemon juice and the dijon mustard in a small jar. Shake to combine. When the final 10 minutes is up, remove the baking sheets from the oven. Divide the green beans between two plates and top with the fish and then the tomatoes. Drizzle the vinaigrette over the top and sprinkle with salt and pepper. Oh yummy. I love Mahi Mahi. What a low calorie meal too. Excellent. Low calorie meals are my new best friend. Beautiful and simple but very well written instructions. Thank you for this gorgeous dinner idea. Ps. I’m a planner too but usually those throw-the-fridge-open-and-iron-chef-it-out meals are the best! Mahi Mahi is not something I could buy in France but I think that most firm white fish would be delicious with this combination! I love the combination of your green beans and tomatoes with the delicious Mahi-Mahi and thanks so much for sharing it with us. Have a great week and come back to see us at Full Plate Thursday real soon! It looks a lovely meal Pam, one I would like to add to my list for grocery shopping 🙂 Thank you so much! We don’t really get mahi mahi here. It’s a recreational fish rather than a commercial one. Looks tasty. Looks terrific! I love roasted cherry tomatoes with just about anything! Yummy this looks so good! Thanks for sharing at Merry Monday! I like this one, I am going to make it soon. Last night I made one of your recipes – The Sweet Potato and Spinach Fritatta. It was amazing! I don’t eat fish, but I know my hubby will love this. This looks amazing, Pam! I love mahi mahi and this is such a wonderful way to serve it! Thank you for sharing this lovely recipe with us at the Hearth and Soul Hop! I love mahi mahi, this sounds like a wonderful preparation! Thanks for sharing at What’d You Do This Weekend?! Yep, that’s going on the summer rotation. Not sure we get mahi mahi here but I’d substitute snapper. I love clean out the CSA meals like this!! I have been terrible about using up all my goodies lately (like…I am drowning in my potatoes) so this is definitely inspirational. I have a slow cooker filled with chicken and vegetables right now for this very reason! This is my kind of dinner – healthy and delicious. Roasted cherry tomatoes are so good! what a tasty way to eat mahi mahi! that’s one of my favs! Looks so delightful and light!